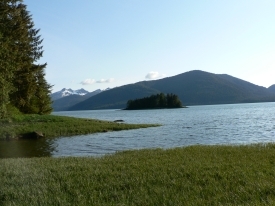 The estuary at Pat’s Creek is a good place to watch pink salmon during late July and early August. Look for American dippers, Sitka black-tailed deer and the occasional black bear along the one-mile trail, which starts on the left side of the highway bridge and follows the creek to Pat’s Lake. The trail is somewhat rugged and quite steep in places. Most years, a few pairs of trumpeter swans rest at Pat’s Lake during the early spring. The American dipper searches for food by plunging headlong into clear rushing streams. Grasping stones with their long toes, they walk on streambeds catching aquatic insect larvae. Look for this gray robin-sized bird on rocks and shorelines along Pat’s Creek. Guided tours to Pat’s Creek are available — check with the Convention and Visitor’s Bureau for details. Pat’s Lake may also be reached by road for those who are not interested in hiking along Pat’s Creek. Pat’s Creek is eleven miles south of downtown along Zimovia Highway.